[pbp] Blood Bowl Team Manager #2: The Manager of the Year has been chosen! Welcome sports fans, both in the stadium and those of you at home tuning in on Cabalvision™, to another exciting season of Blood Bowl! It's the only game out there that offers the real visceral physical contact that'll keep you glued to your seats! And with real viscera, I might add, Bob. I didn't know a person could play that long without their intestines! Indeed, Jim! 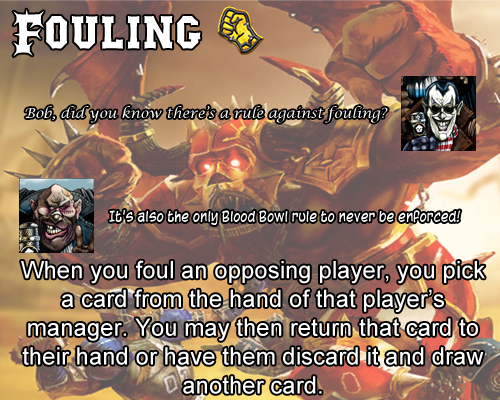 But that's because Blood Bowl offers only the most brutal, quick, and morally compromised players to grace the field. I have high hopes that this season won't disappoint! I share a similar feeling, Bob. But before we dive into the real meat of today's matches, I want to pay a tribute to the real unsung heroes of Blood Bowl. You mean the cleaning crew that have to mop up the aforementioned intestines? No Bob, I'm actually referring to the team managers! They're a sort of glue that barely holds together this whirlwind sport and, like every season, they'll be working hard to earn the coveted Manager of the Year award from Spike! Magazine! Frankly, they're a bunch of overpaid paper-pushers if you ask me, Jim. Did I mention that the Team Managers' Union contributes a significant amount to our paychecks? 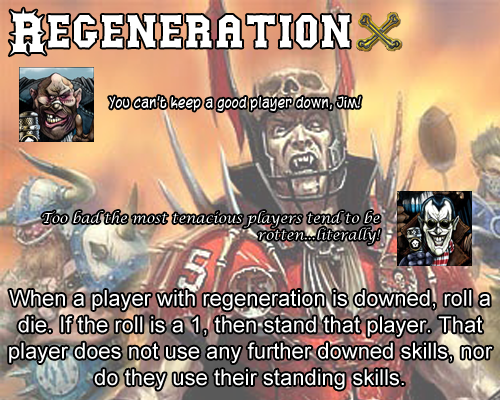 Like I said, Jim, they're true work horses of Blood Bowl, but they'll have their work cut out for them. It's not enough to just win the games, but to develop a team that really gets the crowd worked up. Yes, whether it's through winning big plays, outrageous cheating, or just bribing everyone with cheap merchandise, winning the hearts (and wallets) of countless fans is the true mark of a savvy manager. 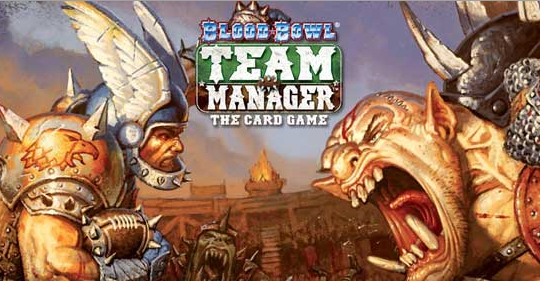 This is Fantasy Flight's Blood Bowl: Team Manager, and it's a card game of high risks and big plays. In a nutshell, you take the role of team manager and compete against other managers to earn the most fans for your team by the end of the season. You do this by setting up your team to make major plays that get on the highlight reel of every week. 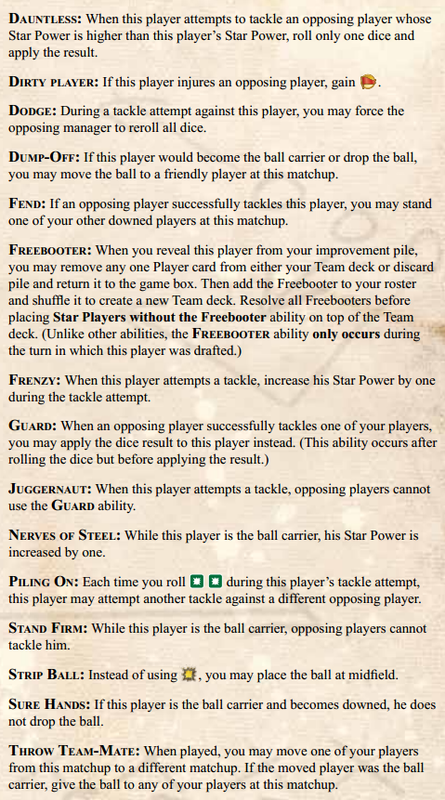 This isn't a game about scoring, but rather unleashing the star power of your players in the hopes of dazzling your fans. Earning fans can be accomplished through crushing tackles to make the other side look bad, skilled running plays to show off your team, or just brutal cheating to get the crowd going. As the season progresses, you'll have the chance to hire star players, add staff members to your team such as apothecaries, get crucial team upgrades, and score potentially big contracts. 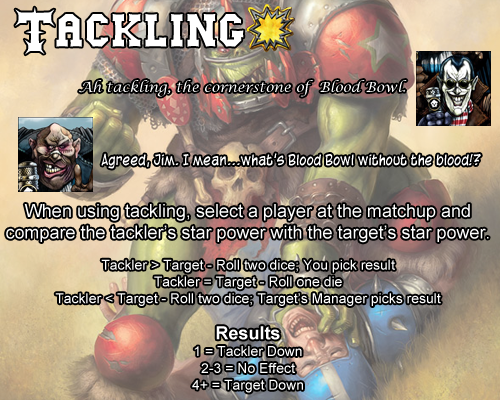 It all culminates in the final week with the Blood Bowl, a huge tournament with an equally huge payout for the winner. Once the dust settles, the manager with the highest number of fans take the Spike! Magazine Manager of the Year award! Upgrades will work in a similar fashion. In the event a manager has an upgrade or player ability that can respond to another manager's action, the active manager should notify that player using the @ system so they are aware that they have an opportunity to pass or take an action. IMPORTANT NOTICE: To prevent confusion, "player" refers to the cards you'll be playing in the game, whereas "manager" refers to the real-life participants of the game. The game takes place over a series of five rounds called "weeks" that have four highlights and a headline or tournament. A Spike! Magazine Headline is a special event that slightly twists the rules of play for that specific week. A tournament is a special highlight that we'll get into later. The meat of the game, the Matchup Phase, is committing players to highlights. Each round, managers take turn committing a player to a highlight that has room (only two teams may occupy a highlight; one per side) until each manager has committed their entire hand or passed. When a manager passes, they can no longer commit any more players for the rest of the week, but they can carry their current hand into the next one (they can also discard any cards from their hand). Tournaments are special highlights where all four players can join. They have much higher payouts for the winner, and also have a generous payout for the runner-up (and very trivial compensation for any losers present). The final week of every game will feature the Blood Bowl, a tournament that offers a high number of fans for the winner. Once the Matchup Phase is over, scoring begins. Winning a highlight is simple: have the most star power, with ball possession breaking ties (if no team possesses the ball during a tie, then the highlight ends without a winner). During scoring, cheat tokens are revealed, which have one of the following effects. Ejection: A ref noticed your rule-breaking, and even decided to do something about it! That player is removed from the highlight and sent to the discard pile. All other cheating tokens, revealed or still hidden, on that player are discarded with no effect. I highly recommend you read the rules before playing. The game is rather straight-forward and takes maybe ten minutes to really learn.  We'll also be using the Sudden Death expansion, only we'll be using normal footballs. Skills are the main draw of most players, and allow you to get an edge in points through various means. Regular skills are used when a player is first committed to a highlight, and are played in order from left to right. Downed skills are used whenever a player goes from standing to downed, and are likewise played in order from left to right. If skills are separated by a slash, then you pick either side of the slash and only use the skills on that side. With the exception of Cheating, all skills are optional. *You actually roll two dice and pick one. Here are the teams available for play. Teams share a subdivision from which they draw their star players. The Gouged Eye will have access to different players than a Grudgebearer. 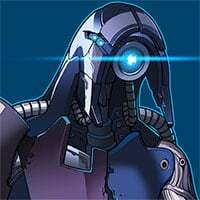 Reikland Reavers: A well-rounded group of humans, they possess the ability to adapt to situations more easily than other teams. Grudgebearers: If you're looking for solid blockers, then look no further than these dwarfs. Voted "Most Stubborn Defensive Line", the Grudgebearers rarely make offensive plays, preferring to wear their opponents down slowly. Athelorn Avengers: These elves are fast, and tend to go for the ball before the enemy team can crush their relatively weak defenses. 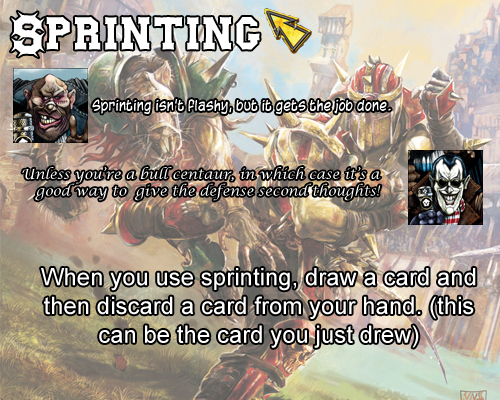 They also have a solid sprinting game in the hopes of catching their opponents off-guard. Skavenblight Scramblers: Skaven are known for being quick and slippery bastards. They compensate for their lack of physical brutality through a solid sprinting and passing game. When a Skaven gets the ball, good luck getting it back! Gouged Eye: Orcs know how to do one thing, and that's beat the tar out of the other team. You can't go wrong with brute force such as the Gouged Eye, but take care you don't get players ejected for sneaking weapons on the field. 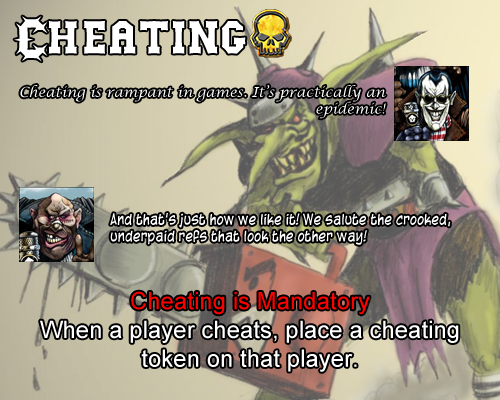 Chaos All-Stars: The players of Chaos know how to do one thing: cheat, and cheat a lot. Sure, they may frequently lose half their team to the penalty box, but it won't matter if they've slaughtered all of the opposition. Naggaroth Nightmares: The dark elves don't mess around, going straight for their opponent's jugular. They don't have the strongest tacklers, but they're a bit more flexible than you'd expect from such a violent team. Champions of Undeath: Looking for a team with resilience? The Champions offer undead players that can get right back up after taking a hit. They may not be the strongest around, but your opponents may be reluctant to even hit them in the first place! Black Fangs: Sure, their thralls are weak, but the vampires more than compensate for it. Even better, vampies can tackle their own teammates for a quick drink of empowering blood. While they lack a single strong player, the Vampires themselves more than make up for it. Nurgle's Rotters: Suffering from countless diseases, the Rotters may not be tough, but their virulent plagues soften up the opposition. The particularly unlucky player contract a far worst illness: joining the Rotters as a plagued beast. The Zharr-Naggrund Ziggurats: This team of chaos dwarfs, hobgoblins, and other nasties find that the best defense is none at all! Through acts of violence and fouling, they ensure that there will be nobody standing in their way when they enter the endzone. The Lowdown Rats: A band of goblins might not seem intimidating on the field, but the Rats have raise cheating and underhanded play to an artform. From explosives to chainsaws, the Rats main strategy is to beat the enemy team before the refs catch wise to their sneaky tricks. To keep myself sane, I may not always include reminder text for keyworded abilities. Check this list before asking me. Just put !Sign Up in bold along with whichever teams you prefer. We'll do this first come first serve, and people that didn't get it will be put on a list so they can get in next time. This game will be using the base set and Sudden Death expansion. Foul Play is not out yet, its feature and the Putrid Players' Guild are not yet available quite yet (but soon...very soon!). With that said: let the best manager win! All right. Let's !sign up. Vampires are going all the way this year! It is the Blood Bowl, after all. I'm too late aren't I? Played a physical game of this a while back and have been itching to play more ever since. Wait, maybe no I'm not? Sign up! Athelorn Avengers gonna run rings around these fools. Or maybe get turned into a fine paste. Whatever. And we have our managers! Foul Play will introduce a fifth player option, so hopefully we can squeeze in more people in future games. I was sceptical going in to my first game but through some arcane magic this really does feel like an abstraction of the full BB board game and not as I had feared some unrelated game with the theme slapped on. You've all been counting down the days, and the time has finally come! The start of another season of Blood Bowl, the grittiest sport out there. How do the teams look this season, Jim? We have teams from all corners of the old world, Bob. We have the Skavenblight Scramblers, the only team not officially recognized to exist by Reikland Players' Commission! Intriguing, Jim. And we can't forget about the Champions of Undeath, who are infamous for their aggressive recruiting tactics. Trust me, Jim, you don't wanna experience that kind of strong-arming! Too true, Bob! And speaking of strong arms, we have the Athelorn Avengers, infamous for their recent game in which a particularly swift pass was responsible for three confirmed player casualties. But they were all from the opposing team, Jim. You have to give their quarterback credit for that kind of accuracy. And our final team is the deadly Black Fangs, who are running yet another charity blood drive next week! Good point, Jim. 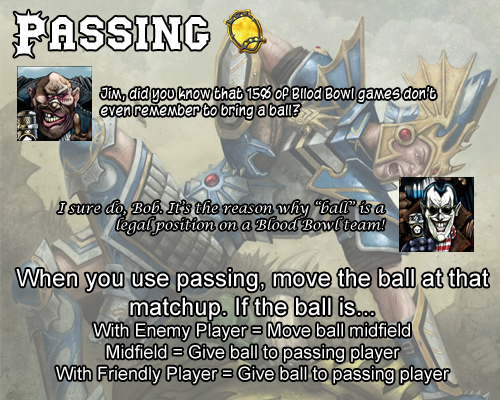 Just another reminder that, in the cutthroat world of Blood Bowl, you gotta watch your neck or someone else will do it for you. Words of wisdom, Bob, but let's get this season underway! This card is a tournament, and will be included with the highlights. Unlike other matchups, all four players may occupy a tournament. @Jam Warrior‌ is up first. First! Curses, how am I meant to steal the ball at the last second if I go first? Let's shove a Lineman (1 Guard/0) into 2A. I assume we're going with 1 is attacker down, 2,3 whiff and 4,5,6 for defender down? No effect. @JusticeForPluto up next. The Skaven Lineman narrowly dodges the tackle! Skaven Blitzer (3/1 Tackle, Sprint if successful Tackle) to 3B. @Bobkins Flymo, do you have a preference between us announcing the results of an action and @ing next in line or you doing so? If you feel unsure about the result, just @ me but otherwise it's not needed. JusticeforPluto discards a Skaven Lineman from sprinting. @Bobkins Flymo‌ those are Wardancer stats Justice quoted. Skaven Blitzers are cheat, tackle, sprint. I know. The stats I sent Justice are correct, so might be a typo on their part. Already added the cheating token, and the power stats are identical anyways. Whoops, I somehow didn't see cheating in there. Curse you fickle block dice! See, just like the table top game. Nuffle remains a capricious god. @Jam Warrior, don't post until morning cause I'm going to bed and I don't want to hold up the game. Author's note: this post is not serious at all and post when ever you feel like it. Zombie at 2B down. @Daemonis to regenerate. @Bobkins Flymo‌ for sprint card please.